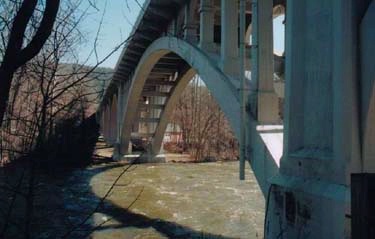 Open-spandrel concrete arches represent one of the high points of early 20th-century bridge engineering. Reinforced-concrete was a relatively new material at the time, becoming a standard bridge-building material only around 1910. Within a few years, engineers realized they could use its unique characteristics to bridge even the widest river valleys with a series of long, high arches. Like stone, poured concrete has tremendous strength in compression, that is, it can resist almost any force that bears down on it, but it is not very good in resisting tensile or bending forces (unlike a steel beam or wood timber). In reinforced concrete, the concrete is poured around a network of slender steel reinforcing rods, embedding them within the structure as it hardens. The result is a material that resists both compressive and tensile forces and is therefore suitable for just about any bridge component. Concrete was also inexpensive relative to other bridge building methods. The biggest material cost was the steel reinforcement; the concrete itself was just sand, gravel, and Portland cement. It was labor-intensive to build the wooden forms that gave the concrete its shape, but the skill required for form work was well within the abilities of any experienced carpenter. When these bridges were built, forms were made of boards rather than plywood, and they left their distinctive marks upon the concrete when they were dismantled. Also, the concrete was made on-site in small mixers rather than being trucked in, so the process of pouring was more time-consuming than today. Nevertheless, the overall cost of a concrete bridge was generally less than a stone masonry bridge or a metal truss. For many highway officials, the fact that more of the cost of a concrete bridge ended up in the pockets of local workers was also an advantage. Although concrete beams could be used for short spans, arches were generally more cost-effective for spans greater than about 50 feet. There were two main types of concrete arches: solid-spandrel (also termed filled-spandrel) and open-spandrel. 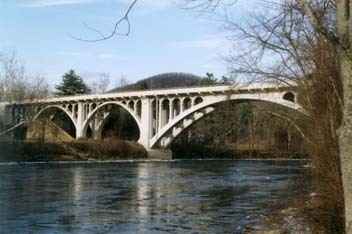 Open-spandrel arches were used for the longest and highest crossings. Although they were much more complicated to design and construct, especially the form work, they saved a tremendous amount of money by minimizing the dead weight. The savings in material was part of the economy, but the real savings came because the load-bearing arch itself, as well as the foundations upon which it rested, could be made much less massive. Open-spandrel concrete arches were often the largest bridge projects of their era, demanding the highest level of technical and project-management expertise. They also were aesthetic triumphs. Even today, the soaring arch ribs and tall columns of Connecticut’s open-spandrel arches create surprise and delight when one comes upon them unexpectedly, and they command our admiration for the state engineers who created such bold designs. For Additional Information . . . This Web presentation was funded by the Connecticut Department of Transportation and reviewed by the Connecticut Historical Commission.